This week I attended a “Strength-Scope” team-building workshop. “Great another team-building day, just what I need.” I’ll admit that I did start out a little sceptical, but I summoned up as much enthusiasm as I could, in the hope that it wouldn’t be a complete waste of time. As it turns out, the session was actually really enlightening and made a fresh change from what I’ve been used to. Before attending the workshop we were all required to complete an online assessment. Then on the day, we were presented with individual reports which highlighted our “significant 7 strengths”. Why seven? Why bloody not? Not surprisingly, given my career in software testing, my strengths included detail orientation and critical thinking among others. We were given time to read the full report and learn a little more about our strengths. The facilitator, a lovely chap called Ian, then prompted us to select our top three strengths and discuss them with a teammate, while also learning about theirs. 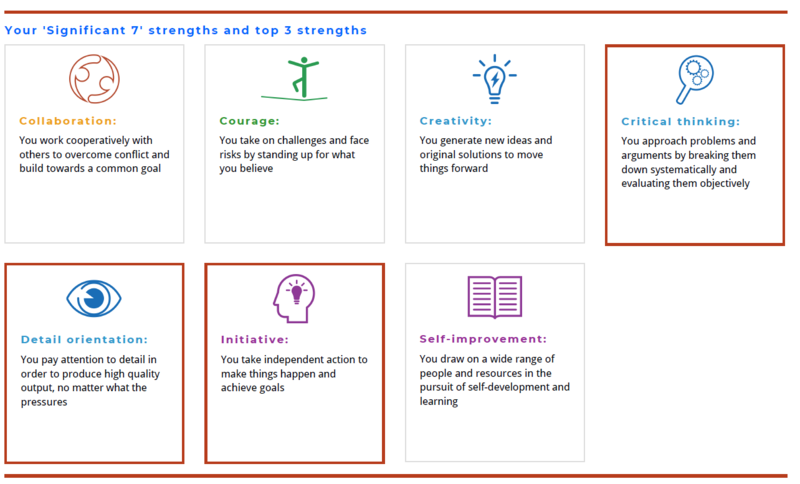 From the seven, I selected critical thinking, collaboration and self-improvement as my top strengths. What came next was, in my opinion, the most valuable part of the day. For each strength, we were given suggestions of how they could be maximised to achieve greater performance. We were then offered examples of when each strength might switch into overdrive, thus turning into more of a limiting factor or weakness. Hearing the limiting factors of critical thinking was particularly enlightening. Examples were given of when overly critical thinking could be perceived as negative or overly-critical by others. This certainly resonated with me and has been something that I have at times struggled with in my role as a software tester. 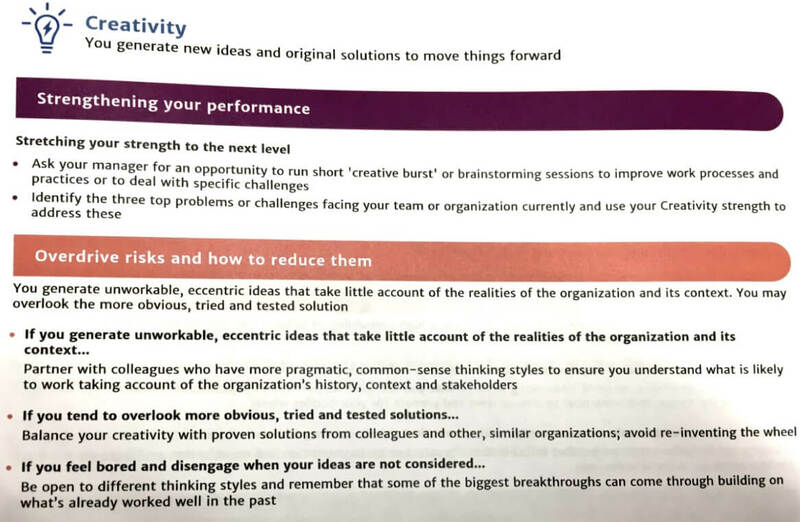 The report gave some useful suggestions on how to prevent a strength from going into overdrive. These included spending more time listening to others and asking open-ended questions to gain a more balanced view of both positive and negative perspectives. Another suggestion was to warn people of your critical eye for detail, using phrases like “playing devil’s advocate, what would happen if…”. This really struck a chord as it’s something I find myself saying quite often. Another technique I’ve used previously is running a pre-mortem role-playing exercise to get others to think about bad potential outcomes, without me having to ask all the probing questions. I’ve also used prompt cards and checklists of questions to get others to think critically for themselves – see Do you want to play a game? Towards the end of the workshop, we were asked to share our most limiting factor with the rest of the team and give them examples of how they could help to minimise its impact. I chose to give my team a prompt word “dragon” and asked them to shout at me whenever they feel I’m being overly critical. “Why Dragon?” For me, a dragon is an awe-inspiring creature, full of energy and passion. That’s the kind of mental image I need when I find myself in a rut of negativity. This can help to disrupt my thought process and shift me into a more positive and creative frame of mind. After the session the energy in the room was palpable and I personally felt invigorated. Not only did I now know my main strengths and how to maximise them but so did my team. What’s more, they were now equipped to warn me whenever they saw me slipping into a potentially negative mindset. Lessons learnt: team away days aren’t all bad; stop being too critical, be a testing dragon instead.